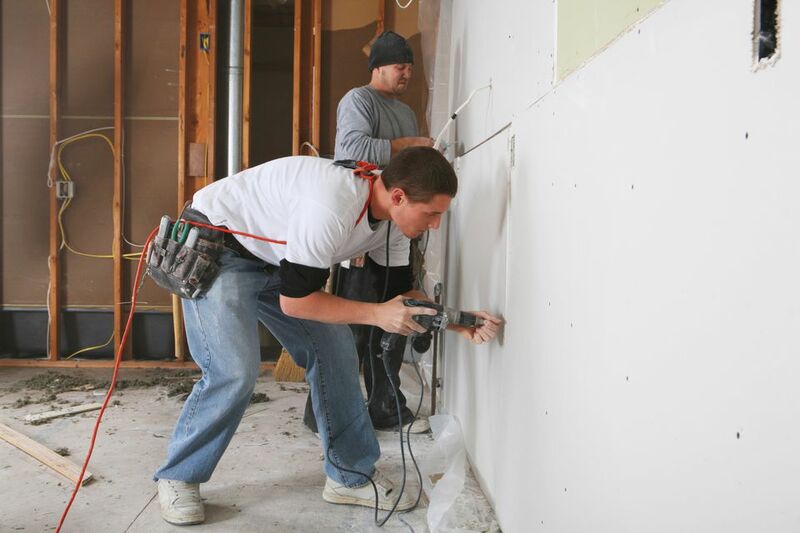 Unlike other home remodeling trades like electrical work, hanging drywall is not a 100% exacting process. Fortunately, you can finesse some aspects of drywall hanging to your own advantage. While creative usage of drywall compound and subsequent painting can cover up some flaws in installation, you'll make your job easier by hanging the drywall right in the first place. Secrets, tips, hints, or hacks, whatever you like to call them, these are employed by veteran installers and can come as a savior to amateur DIY installers, who usually need a crutch with this near art-form. Much of it is plain common sense (mark your stud positions), while others emphasize logic that might have escaped you in the heat of the installing moment. How: Use a carpenter’s pencil to mark the on-center point of each vertical stud. Mark on the floor and mark once more as high as possible. If you can’t mark on the surface, use a tab of painter’s tape. Why: After you hang the sheet, you need to know where the studs are in order to screw into them. While you can figure this out with a stud finder or by measuring every 16" on-center, it is so much easier to follow floor and ceiling stud markings. How: After you get your drywall panel initially tacked in place, the next best thing to having x-ray vision is to draw a line showing the center of each stud. You will be driving screws on this line. Why: While it is beneficial to have the ceiling and floor marks (as listed in the previous tip), it's even more accurate to mark the center of each stud. How: Run the head of your hammer down all surfaces where drywall will be fastened. You’ll be able to hear protrusions when the hammer hits them. Pound down nails or cut or sand down protruding studs. You want your surface completely flat. Kinks in insulation paper can also create bumps on studs that make it difficult for the wallboard to lay flat. Smooth out the paper and make sure it is stapled down tight. Why: It may seem improbable, but even the tiniest protrusion is enough to prevent the board from laying flat. How: Pay attention to threads when buying your drywall screws. You’ll need coarse thread, not fine thread, for driving into wooden studs. For 1/2" drywall, 1.25" long screws work best. Why: Coarse thread screws pull into the wood easier and hold tighter. Screws that are too long are difficult to sink to the correct depth. Screws that are too short will not adequately hold the panels. How: It’s hard to drive your screw-head deep enough to dimple the panel’s paper, but not so far that you break the paper. But that’s what you need to do to hold the panel tight. Angling your work light at a low angle to the wall helps you better see the crease when it develops. Why: A drywall screw that is correctly vs. incorrectly sunk is a matter of just a few millimeters. Protruding screws make mudding impossible. Screws that are sunk too deep will not hold the panel well. How: The trick to cutting drywall length-wise is to first score one side of the board, then go to the back side and crack the board with your knee. If you hit it in the right spot, it will easily separate. Why: Cutting lengthwise is one of the more difficult cuts you can make with drywall. How: A drywall lift, easily rented at most local rental yards, hoists drywall into position for hanging on ceilings. You can even make your own ad hoc drywall lift. Why: Whatever you do, don't try to get that sheet up on the ceiling all by yourself. You can injure yourself and/or damage the panel. Even though drywall sheets are incredibly heavy and floppy (especially the 12' sheets), it is possible to install drywall alone. The trick? Lifting tools.